Roger Brook - the no dig gardener: What is a biennial? Many gardeners don’t ‘get’ bienniality. They know that a biennial is a plant that completes its life cycle in two years, They know that it germinates, grows and accumulates resources in the first season; overwinters, flowers, sets seed and dies in the second. * Forget-me-nots set seed which germinates immediately and new plants flower and set seed the next year. *Parsley sets seed that naturally germinates in the following Spring. It makes a strong plant in the first season and after the Winter’s cold makes a vigorous flowering plant that sets seeds and dies. Inexperienced gardeners sometime sow parsley in Autumn and get runty little plants with unwanted flowers! It is the consequences of the biennial life cycle to practical growing that we need to understand. To be fair if we are to go by definitions in the botany books - such as the one I have given - biennial plants don’t understand bienniality either, (and perhaps I should mention ‘bienniality’ isn’t even in the dictionary!) Many biennial plants just do not behave like the book says! I used to explain the meaning of biennial by using vegetables such as carrot, swede or parsnip as examples. Such plants accumulate reserves in their roots which they ‘spend’ when they flower the next season. In most cases we eat biennial vegetables before they flower, set seed and die the next year! Most biennial plants need the Winter’s cold to prime them to flower later in the year. This cold requirement is an example of vernalization which literally means ‘preparing for spring’. Seedsmen need their biennial vegetables to flower to get seed! Although most biennials store reserves in their root, any part of the plant has potential for food storage. The onion bulb is a kind of underground/surface bud, and above ground a brussel sprout is also a bud. Biennials like parsley store food in their stem and leaves as well as their roots. A cabbage is a tight cluster of leaves. All of the above vegetative structures store food for the next year. Nature is endlessly resourceful although in the case of many vegetables it is with the help of the plant breeder. In cases such as brassicas, plant breeders have sometimes bred out the bienniality and for such as cauliflowers, not only are they grown like an annual they will actually complete their life cycle in a single year. Sprouting broccoli normally produces edible shoots and subsequent seed the following year. Not this one which has behaved as an annual. If you want your biennials to make strong plants for their second season, perhaps for a strong head of flowers, or in the case of vegetables to eat a lot more parsley leaves or brussel sprouts they must be sown sufficiently early. It is vitally important that they have time to build up their reserves. A good guide is to sow hardy biennials such as Canterbury bells, evening primroses and many others when they naturally set seed. In many cases it is even better to let them sow themselves. If in doubt when to sow seed of biennial flowers sow them in late Spring. Beware some biennial vegetables such as beetroot which if sown too early are vernalized by the cold and flower - described as ‘bolting’! As mentioned they store their reserves in the buds. ‘Food’ no doubt is also stored in the thick stems as well as their leaves. If it is a good winter the leaves continue to photosynthesize and make extra nourishing sugars. Do not eat the tops too soon, their continued activity will support further sprouts in Spring. In fact you get a feast in late Spring when the sprouts start to shoot and make flower - as biennials are programmed to do. They would not sell in Tesco but the sprouting sprouts and flower buds are the very best vegetable I know. Manipulate the bienniality of ‘brussels’ to get six months of Winter and Spring vegetables from a single sowing! Sprout plants are botanically very interesting when they are invaded by disease such as common brassica downy mildew. Their genetic aim is to flower next year using stored resources which are mainly in the sprouts and tops. Old leaves on the stalk are an expendable resource especially as they are shaded and winter light is poor. Rather than fight invading mildew with ‘resource expensive’ natural toxins they let these leaves yellow and die. They conserve their stored food reserves and keep the buds healthy. In my view it is foolish if in a good season when their is no downy mildew to remove lower leaves - as is common practice - when they are green. Plants do always comply with botany books and most can behave as an annual or perennial if the mood takes them! These are some common causes of biennials not being biennial. Honesty sometimes germinates from the current years seed in late Autumn. It does not have time to make a strong plant as it would normally do. It overwinters as a seedling and is stimulated by the winters cold to try and flower in Spring.It does this rather pathetically but may set a few seeds. Strictly this still qualifies as a biennial but in my opinion it is more like an annual that spans one year to the next. 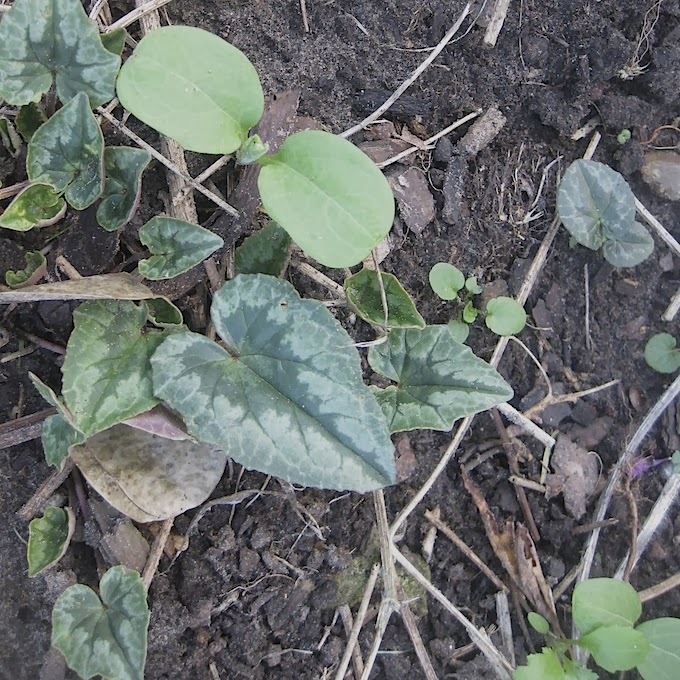 Variegated honesty is green in its first season if it germinates in early summer but it will have beautiful variegated leaves when it flowers in Spring. If these scruffy leaves are cut back now it will still flower but not as well as if you leave them alone.. The honesty seed of the current year has just germinated in October. It will flower in Spring but it will not be special. Foxgloves are a law to themselves. They seed everywhere, even in very heavy shade. I once had a student who sowed them abnormally early in a heated glasshouse in January for his plot project. When bedded out they were magnificent that Spring. In fact nowadays there are some annual strains that you can buy from the seedsman; that’s not to mention those foxglove strains that are short lived perennials. Even the ordinary foxglove behaves as a perennial and flowers for at least one extra season if it is thwarted in flowering - perhaps chopped back early and not allowed to set seed. Some biennials if they fail to make a strong plant in their first year take an extra year, sometimes even two, before they flower and die. My featured giant ferula behaves in this way. I collected and sowed this ferula seed last year and these pathetic plants are all I have one year later. They will not have the resources to flower next year. But in 2015 they will be quite magnificent. I used to say that wallflowers were perennials grown as a biennial. I think I was wrong. 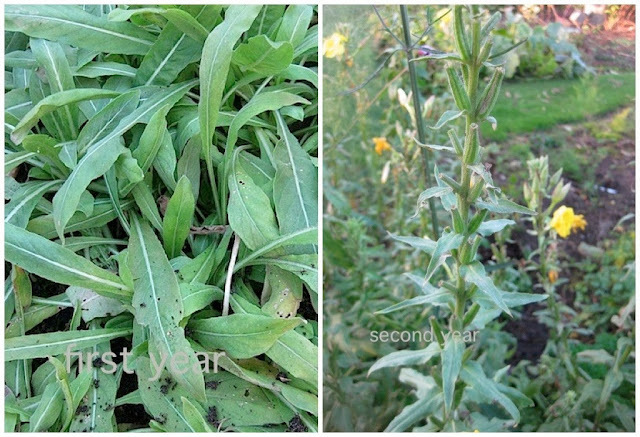 Most common bedding wallflowers seem to be genetically programmed to flower in Spring and die. There are of course many other lovely wallflowers that are ‘short lived perennials’ and the yellow one featured cannot decide what to do. Both the wallflower and the forget-me-not self seed each year. Neither are quite sure whether to flower again the following year and be a short lived perennial! Lychnis coronarius is usually a short lived self seeding perennial! Forget-me not and Love in a mist will both flower next year. Why is the mysotis a biennial and the nigella an annual? I have recently mentioned annuals such as nemophila, and limnanthes (the poached egg plant) that set seed and die between May and July and germinate in August/September. They make very few flowers in Autumn but flower magnificently the next year.I have currently got tiny seedlings of self sown nigella (love-in-a-mist) which will bravely overwinter. Many annual house plants such as cineraria and calceolaria also span successive years, usually flowering about Christmas time and dying in early Spring. I would suggest that none of these are examples of biennials. But I am not sure I can give you an adequate explanation why! Perhaps someone will embarrass me by enquiring why on the above criteria I do not regard ‘forget-me-not’ as an annual! Clearly I don’t ‘get’ biennials either! If you let your parsley set seed in its second year it will sow itself and the young plants will give you continuity of production. Because nature plays the odds to maximize its success all the seed will not germinate at the same time, nor will you have much control where the seedlings appear but I promise there will be plenty. As one who now admits to not ‘getting’ biennials I have a small difficulty here. I really cannot remember whether the seed in my parsley bed germinates in the year of production or the following early summer. I suspect both and this ensures that each year there is seed in the ground to provide renewal of my plants. Now I do not claim to have parsley quite all of the winter. It depends on the year. Brenda will sometimes request parsley in January and I might scrabble around and in triumph find a handful of leaves not killed by the cold. (The parsley will probably be for my parsley and chopped egg sandwiches which I love when I get back from bridge late every Tuesday night). By February the parsley has grow some new leaves and is a little stronger. From then on it goes from strength to strength. By June we are embarrassed with parsley and the plants start to prolifically flower and seed. On a few of the plants I cut off the attempting seed heads to ensure continuity of my sandwiches! Eventually the mature plants die (or perhaps a few of those I did not let seed do not?). By this time we have lots of strong new plants that germinated in Spring to continue the cycle.Brenda is delighted that a few of the seedlings have ‘reverted’ to the none curly type which she says have greater flavour. Current years germination of parsley. Last years plants have by now scattered seed which will provide next year’s plants. One tip if you are growing parsley for the first time. It takes up to about six weeks to germinate. Some gardeners won’t find their seedlings among the weeds! Sow a few seeds in a small pot and a few weeks after germination pop the complete rootball of seedlings straight in the ground. I have a website about flowering plants for schools and simplified biennials by describing them as plants with a life cycle that lasts two years but thinking about it - they don't do they? Many of the things we call biennial e.g. sweet Williams are actually annual plants that just span two calendar years but their life cycles are often completed within a 12 month (or less) cycle. Oh dear - do I need to do some editing or do I leave it simple for school children? Keep it simple for the kids! I think most things in my life especially gardening starts with the simple recipes until as you get to know more you adjust your techniques to your own circumstances. My friend and bridge partner Elaine teaches bridge- the fundamental principles that are basic to the game, especially the bidding need to be taught, but as you learn more you become more sophisticated. Elaine does not bid like she teaches! A real teaser this one, as for the difference between the biennial mysotis and the nigella, I think that broadly speaking biennials flower and set seed in the earlier part of the year giving them a long growing season to establish ready to flower and fruit early the following year. Annuals on the whole flower later mainly from seed sown that year, the fact that the seed of some does actually germinate shortly after seed is produced must be seen as a bonus allowing the plants to flower slightly earlier the following year and is outside the "normal" growing season. I think this could even be linked to factors that affect the plant in its natural habitat. I grow quite a few meconopsis some of which are monocarpic, the majority of which are effectively biennial, making their growth in the first year from a winter sowing and early spring germination and flowering in the second year. Where this does not apply is either from a late germination or if the plants have been unintentionally held back by not potting on fast enough for example. If insufficient growth is made during the first year, although one or two may attempt to flower in the second year the majority will become more established and flower in the third year. I am inclined to believe that there is a closer link between biennials and perennials than that between them and annuals. Excellent post Roger, and very well explained. I like the in depth portion on vegetables. Foxglove seeds profusely in my garden, but not every year are the flowers tall and strong. Many times some squat flowers bloom in the snow. Same with parsley. I have both now topped with a dusting of snow. Its good to hear your news from Niagara Donna. I enjoyed your recent post about your lovely Autumn colour over there. Want to complicate the question further? Add a mid-year winter, as we have in the Southern Hemisphere, where biennials can be sown towards the end of one growing season and flower in the next, all within the same calendar year. Despite this, we were still taught - inexplicably - that biennials were plants that lasted two years. Ignorant and highly confusing! Hardy annuals, of course, can follow exactly the same pattern. There is for me a vague distinction between plants that form a low rosette in their first growing season that then dramatically 'bolts' in spring (which I'd comfortably label as biennials), and those that start building a typical branched structure in their first growing season, pause due to cold over winter, then complete this skeletal structure before flowering in spring/early summer (which I comfortably label as hardy annuals). But there's so many exceptions to all that as well. The more you think about it the muddier it gets. But thanks for the best explanation of the issues I've read yet. I'm so sick of simplistic (and very often confusing or misleading) definitions! Great to get a new perspective from other parts of the world Michael. I used to tell my students that plants did not always conform to what the school botany books say - and certainly not gardening books. Plants just won't obey the rules!